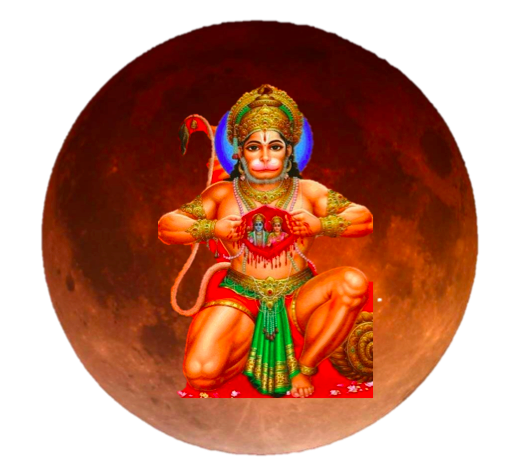 Ostara/ Blood Moon Lunar Eclipse / Hanuman Jayanti : Red Shift! We are navigating through two eclipses in a row, from the 20 March 2015 Spring Equinox / New Moon – Full Solar Eclipse to the 5th April Easter/ Passover and Hanuman Jayanti 4th April ( Birthday of Hanuman – the monkey god) / Full Moon Lunar Eclipse! This also corresponds to an important transition from Winter to Spring. Eclipses are events of cosmic/planetary alignment when the power of the emotional mind ( represented by the Moon ) is amplified , hence we can be affected by becoming highly sensitive and confused. How to stay grounded in times of great activation ? By simply remaining anchored in the power of our true nature, that is essentially Prana / the inherent intelligence of all living being. I have found the answer to this question by reflecting on the beautiful myth of how Hanuman ( little Anjaneya) got his name. This story is told in the epic Ramayana. Hanuman was born into the Vanara community ( people living in the forest) and was of reddish orange color. He was called Anjaneya , that means the son of Anjana and Vayu ( god of Wind). Hanuman – also thought to be an incarnation of Lord Shiva – represents the power of Prana, the conscious breath. He embodies, strength, vigour and vitality ( red colour) . Hanuman is said to be able to assume any form at will, wield rocks, move mountains, dart through the air, seize the clouds and rival Garuda, the mythical creature vehicle of Lord Vishnu, in swiftness of flight. He is worshipped in folk tradition as a deity with magical powers and the ability to protect from darkness. As a child, believing the sun to be a ripe mango, Hanuman pursued it in order to eat it. Rahu, a Vedic planet corresponding to an eclipse, was at that time seeking out the sun as well, and he clashed with Hanuman. Hanuman thrashed Rahu and went to take sun in his mouth. Rahu approached Indra, king of the gods, and complained that a monkey child stopped him from taking on Sun, preventing the scheduled eclipse! This enraged Indra, who responded by throwing the Vajra (thunderbolt) at Hanuman, which struck his jaw (hanu) . He fell back down to the earth and became unconscious. A permanent mark was left on his jaw, due to impact of Vajra, explaining his name. Upset over the attack, Hanuman’s father figure Vayu (god of the wind/ Breath) went into seclusion, withdrawing air along with him. As living beings began to asphyxiate, Indra withdrew the effect of his thunderbolt. The devas then revived Hanuman and blessed him with multiple boons to appease Vayu. Thus Anjaneya came to be known as Hanuman and had many more adventures during his childhood. With the blessings of all the gods,Hanuman became a great warrior later and had helped Lord Rama in his quest to bring back the latter’s wife, Sita. This incident is known to everyone and is recorded in the great epic called Ramyana. The Red colour of the Blood Moon symbolises Life and fertility. Hanuman Jayanti is an important festival of Hindus. During the festival of Hanuman Jayanti the devotees visit temples and apply tilaka of sindoor to their foreheads from Hanuman’s idol as Hanuman himself was of that color. Eclipse between Spring and Easter. As Eclipse is an event where there is a temporary interruption of transmission of vitality from the Orb of the Sun ( Spirit) to the Earth ( body) and then to the Moon ( Mind) we might temporarily experience Emotional confusion and agitation and physical disconnection. Spring represents rebirth as well as the end of Winter. Ostara stands for fertility . At Spring the Fire is re ignited in the womb of Earth, that becomes fertile ( Eggs and bunnies of the Easter celebration) . Red (Fire) vitality comes back to the body ( Earth) as well. So Spring/ Ostara and Eclipse are two opposing forces. How do we counter balance that? Hanuman ( Conscious Breath – Pranayama ) is the answer. Hanuman ( Prana/ Red / Vitality) , King of the Monkey warriors, in the Ramayana is the link that makes it possible for King Rama ( Spirit) to retrieve and reconnect with his wife Sita ( Soul) and reconquer his kingdom. Prana is the missing link! At time of Eclipses you might become agitated and your breath erratic as a reflection of your state of mind. Then practice slow, conscious , deep , invigorating breathing, with a little bit of retention on Inhalation if capable . Best technique to embrace would be Alternate Nostril Breathing. By blocking the right or left nostrils ( the termination of Pingala / and Ida Nadi, Sun and Moon Channel), you will effectively rebalance the chemistry of your brain, harmonising right and left hemisphere and restoring a state of deep equilibrium. This is a sound , simple and effective technique that will help you when you feel that strong emotions are overriding your power to stay present and calm. Hanuman also embodies the perfect devotee. Practice surrender of any worries and preoccupations that seem insurmountable by connecting with something bigger than you. As Krishnamacharya used to say, everyone is devoted to something/ someone. It can be your parents, your ancestors, Saints or Sages that have walked on the planet and inspire you with their lives, the orb of the Sun, The Intelligence of the Universe or ultimately Source/ the Divine. Breath, mantra and devotional attitude. Previous postSpring Full Moon – Holi Yogic Salad! Next postHappy Sharad – Lakshmi Poornima / Full Moon- Ivy or Hunter Moon/ last SUPERMOON of 2015!